With less than a month to go before The Avengers film, it’s about time we sit down and talk about what sort of comics and graphic novels you should be reading so you might more fully enjoy the experience of the film. Since this is, arguably, the most anticipated superhero film of the summer, don’t you want more context for where it came from? The Avengers have been a team since their first issue came out in September 1963. Stan Lee and Jack Kirby assembled a team of pre-existing superheroes to battle threats that couldn’t be tackled by any one superhero. That first issue pitted the original team (Hulk, Iron Man, Thor, The Wasp and Ant-Man) against Thor’s brother Loki. Captain America didn’t join the team until the fourth issue of the book. A good start for reading about a version of the origin of The Avengers would be Mark Millar and Bryan Hitch’s 2002 series The Ultimates. The first and second volumes are available in graphic-novel form, and are the most recent re-imagining of Marvel’s flagship team. These books are contemporary and palatable to a modern audience in a way the original adventures of The Avengers might not be. Since The Ultimates is an alternate Marvel Universe where things are a bit more realistic, it might not be everyone’s cup of tea. For those who enjoy more traditional “fights & tights” books, there is a run of Avengers adventures that still gets me where it counts. Brian Michael Bendis—who has been the mastermind behind much of the Marvel Universe over the past decade—laid out the blueprint for one of the most epic and long-running dramas in comics. Starting with the graphic novel Avengers: Disassembled, moving through House of M, Civil War and Secret Invasion, Bendis brought us a story that tore The Avengers apart and forced them back together again. At the beginning—in Disassembled and through House of M—tragedy strikes, and The Avengers are attacked by one of their own: Magneto’s daughter, the all-powerful Scarlet Witch. Lives are lost, and The Avengers are broken. 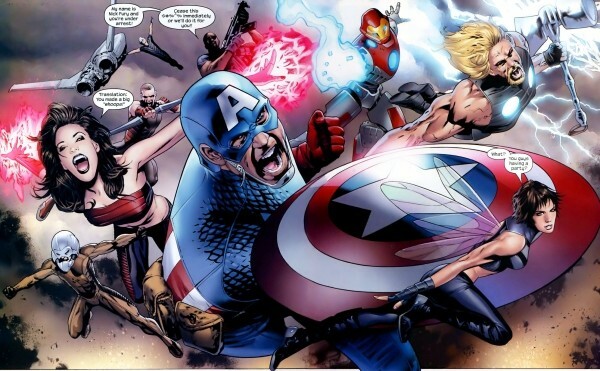 Then comes the Civil War, pitting Iron Man and Captain America on opposite sides of battle. For me, more than any of the other books, Civil War is everything that makes me excited for this upcoming film. Robert Downey Jr. and Chris Evans (as Iron Man and Captain America, respectively) bring a chemistry to the roles that I’m not sure people realize has existed in the comics for quite some time. Iron Man is a blustering ladies’ man; Captain America is a straight-laced, old-fashioned hero. In Civil War, the government insists that all heroes give up their right to privacy, and Iron Man is on their side. Since it went against everything Captain America stood for, it created a rivalry that shook the very foundations of the Marvel Universe. Cap goes underground, leading a resistance cell of heroes dedicated to the right to privacy and due process, while Tony Stark and his goons on the government payroll are hunting them down and forcing them to register. If anything, I hope this is where the movies will eventually be heading. Another favorite of mine that’s not strictly an Avengers book, but features them heavily, is Marvel Super Heroes: Secret Wars. This was a 12-issue miniseries that came out in 1984 and featured pretty much every character in the Marvel Universe. It’s a little cheesy at times, but was one of the most influential comics I read and re-read repeatedly as a kid. It’s fun and that’s all it needs to be, which is what I’m expecting of the movie. All of these books are a fun ride and, taken together, will give you a pretty good cross-section of what you can expect from The Avengers. The film hits theaters May 4.